Call off the hunt. We've found the worst possible take on the Internet. Terry Rossio is a fairly successful screenwriter, credited with the blockbusters "Pirates of the Caribbean," "Shrek," and "Aladdin." He's also a finalist in the All-Time Worst Hot Takes on the internet. When another writer encouraged people to donate to UNICEF to get polio vaccines to kids in need in other countries, Rossio argued that her suggestion was doing more harm than good. The back and forth was predictably filled with a lot of anecdotal and unscientific claims, to which the original writer dismissed Rossio's arguments as "anti-vaxxer" and not backed by facts. And that's when Rossio decided to really prove his point of privilege in the worst way possible. So now, being called (factually, mind you) an "anti-vaxxer" is the same as a word that so symbolizes centuries of oppression, enslavement, abuse and hatred that decent human beings don't even utter it? Sit the F down, you ridiculous, anti-science, idiotic white man. People can choose to be scientifically illiterate disease mongers; people can’t choose the color of their skin. These situations are not equivalent and shame on you for suggesting otherwise. 3. The "n" word is a vile, blood-soaked epithet used to demean decent, upstanding people. "Anti-vax" is a mild way to describe people who endanger their own helpless children & their entire community. 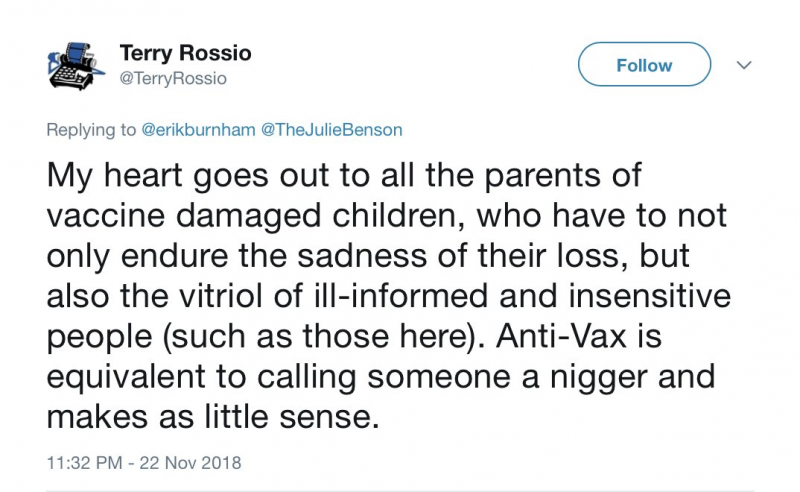 Outside the offensive racist tone, I admit to being completely impatient with this whole line of anti-vaccine rhetoric, for a variety of reasons. First and foremost, I grew up outside the US in a country that didn't have an immunization program at that time. I saw what that looked like up close and personal. It's frightening and horrible. Death, defects and hardship that are completely unnecessary due to scientific advancement. It's an incredible place of privilege to forget that not so long ago this country was ravaged by polio and smallpox. My fifth grade teacher was paralyzed from the waist down by polio. That babies died from exposure to the measles or had permanent damage from rubella. I don't know if Rossio has a child along the autism spectrum that sparks this desperate clinging to a long debunked claims of the disgraced and fraudulent Andrew Wakefield (who lost his medical license for his unethical behavior), but the amount of damage done by pushing these anti-science claims is manifest. Perhaps it's not a surprise that Trump has also openly dabbled in anti-vaxxer conspiracy-mongering (right around the time Barron was a toddler. I'll let you do the math.). And that is another part of my problem with this. I have Crohn's Disease and I have to be on immunosuppressants to keep my body from attacking itself and killing me, which it came close to doing four years ago. I have a friend who had a liver transplant and is on anti-rejection drugs (also known as immunosuppressants) to keep his body from rejecting that organ. I have another friend who has thyroid cancer and is currently undergoing an high dose chemo to fight it. My husband lost his spleen in a near-fatal car accident. All of us rely on herd immunity to protect us from viruses that we cannot fight off on our own. When wealthy white families (and it's ALWAYS wealthy white families) refuse to vaccinate their children out of dread that their darling one might be autistic (as if that's the worst thing possible to happen to their child), despite the numerous studies assuring them that vaccines are safe and critical, they put my and many, many others' lives at risk. People like this infuriate me. My daughter got measles from an anti-vax caused outbreak when she was an infant and too young to be fully vaccinated. Seeing your lethargic baby go through febrile seizures is something I wouldn't wish on my worst enemy.